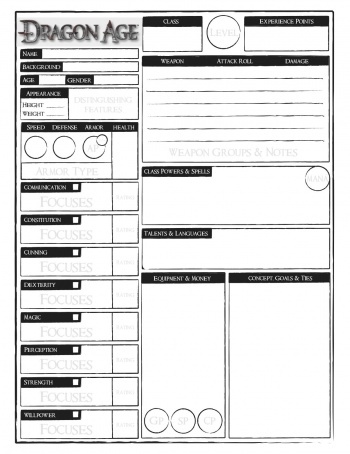 There are a huge range of characters in the Dragon Age universe - Grey Wardens, mages, templars, elves, dwarves, sea raiders, and many more - and the core book covers them all with an easy-to-follow character creation system. Just like the video game, there are only three classes - Mages, Rogues, and Warriors - which keeps the mechanics for creation straightforward. But the real flavor of your character is determined by backgrounds and specializations. Character background is chosen before your class, determining your culture, race, upbringing, and proficient skills. Dragon Age has a staggering 30 backgrounds to choose from, including Fereldan Noble, Dalish Elf, Surface Dwarf, Circle Mage, and even Qunari Tal-Vashoth. As you level up, specializations come into play. Specializations are unique talents that distinguish you from other players of your class while providing certain mechanical benefits. Combined with backgrounds, the simple system allows for a enormous variety of characters. Will your apostate become a Blood Mage or a Spirit Healer? Will your city elf become a Bard or a Ranger? Will you train your Orlesian noble as a Templar or a Chevalier? There are seemingly countless choices available to you, with every single one fitting into Dragon Age's massive setting. In practical terms, the modular character creation means you can create a huge range of unique characters. But it's also absolutely possible to add your favorite Grey Wardens and Inquisitors into the mix. My own players ended up converting two versions of Origins wardens, complete with campaign items like the Key to Orzammar. There's a satisfying and deeply personal touch to running new adventures with your favorite characters - even if it breaks canon to put multiple wardens in the same party. The downside is that if you're creating a high-level character from scratch, the creation process will be long and tedious. It's far easier to start small and upgrade over time than prepare a fully-designed hero for a high-level adventure. But regardless of how you get there, each character will feel unique - and unlike some systems, Dragon Age doesn't need complicated multiclassing. As a tabletop game, Dragon Age faces a unique challenge. Many of its fans will be long-time RPG players who want the in-depth experience of traditional fantasy games. But at the same time, many will be newcomers who only know the video games, have never experienced tabletop rules, and would be turned off by excessive number crunching. Trying to satisfy these two groups is harder than convincing Origins fans that Dragon Age 2 was just as good - but Green Ronin pulled it off with flying colors. To start, players have only eight skills to control all actions in the game. But to represent individual experience and training, characters can also purchase focuses that attach to skills - someone could add a Stealth focus to their Dexterity roll, or Axes to their Strength, or Faith to their Willpower. Outside of the storytelling opportunities each focus implies, anytime you attempt an action that uses a focus you automatically get a boost to the roll. This keeps the skill mechanics simple for all players, while encouraging everyone to buy a diverse set of focuses to use in play.